This is the story of real life mother Edith Bouvier Beale and her daughter Little Edie Beale. They were the aunt and cousin of Jacqueline Bouvier Kennedy. 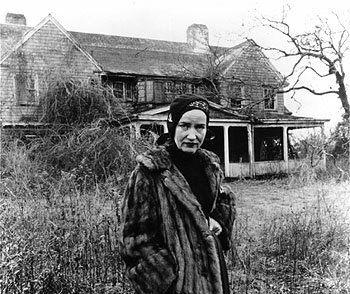 In the 1970s it was discovered that they were living in squalor as mad recluses in East Hampton New York, in their 28 room mansion named Grey Gardens. Grey Gardens is based on the documentary of the same name. I was lucky enough to get the last ticket for this afternoon's matinee performance. I have been anticipating this new musical for some time since I knew it would be an opportunity to hear Christine Ebersole sing on the stage again. (I caught her in her Tony winning run as Dorothy in 42nd Street in 2002). 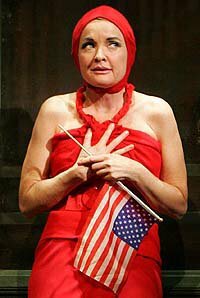 Christine plays two roles - the mother Edith Bouvier Beale in Act 1 and her daughter Little Edie in Act 2. I knew she would be out of the world and I was right. She is damn funny but can grab you emotionally and has a gorgeous old-style voice. Overall it has a good cast. Although her voice is good, maybe there is a little miscasting in the first act as Sara Gettlefinger playing the 20 year old Little Edieas it is very hard to believe that she isn't really 40 years old. John McMaster delivers a funny grandfather Bouvier and the little girls playing Jackie and Lee Bouvier are adorable. The first act is a bit like a 1940s movie musical with a beautiful set and costumes. The songs are stylized and catchy. But it is in the second act that they really get down to the nitty gritty. The mother/daughter co-dependent madness is conveyed hysterically, yet it is the story of the daughter that breaks your heart. 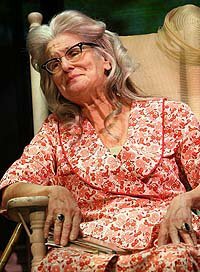 Mary Louise Wilson is a riot as the controlling, ailing mother while Christine is over the top as her completely mad daughter who longs to be on her own. It is not clear how long it took them to come to this, but you see that they really have no way out. The theme of being independent is strong throughout both acts. She blames her mother for her plight but cannot break away. The first scene is side-splittingly funny and by the end, the songs bring tears. In the end, they fade out, still together. Grey Gardens is still in previews and at an after-show talk, it was evident that the creative team is continuing to make changes. Right now, it feels as if it is two one-act plays...or maybe the first act is just a flashback. 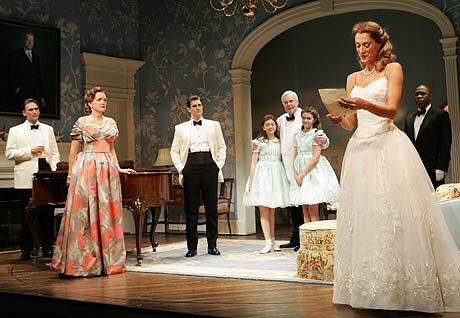 It is being advertised as a limited run at Playwrights Horizons. However, this is a show that deserves time to be seen and celebrated.